Barcelona. Good at the football. 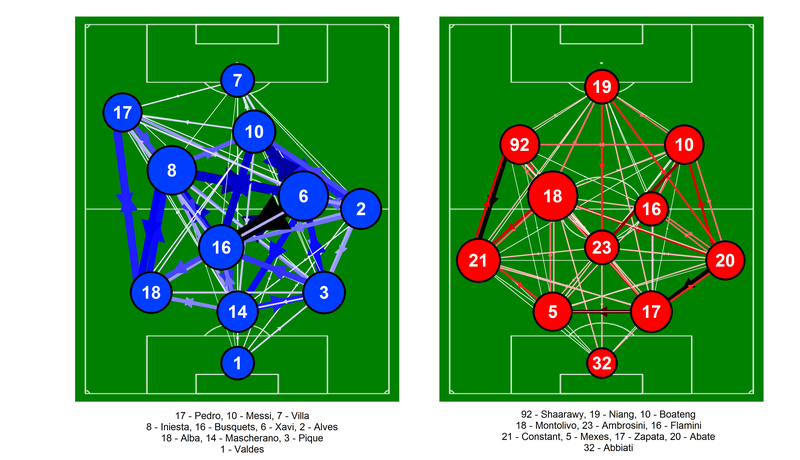 Passing network for Barcelona and AC Milan from the Champions League match at the Camp Nou on the 12th March 2013. Only completed passes are shown. Darker and thicker arrows indicate more passes between each player. The player markers are sized according to their passing influence, the larger the marker, the greater their influence. The size and colour of the markers is relative to the players on their own team i.e. they are on different scales for each team. Only the starting eleven is shown. Click on the image for a larger view. Passing matrices from Uefa.com press kits. More information on these passing networks is available here. I don’t have time for a fuller write-up but this from Zonal Marking is excellent.